Castle life at the gate to Ile de France! 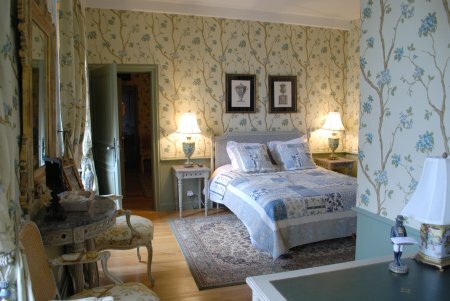 50 km away from Paris only, the chateau de Maudetour offers an unforgetable stopover in the vicinity of the chateau de Villarceaux golfcourse and of Claude Monet's gardens at Giverny. 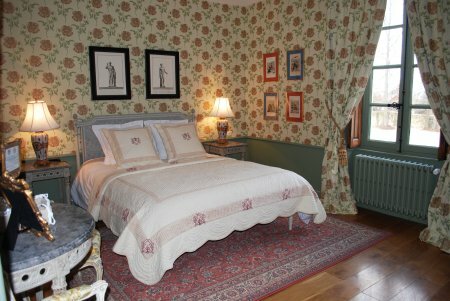 Staying at Maudetour is quite a privilege. The domain was due to be converted into a luxury hotel. 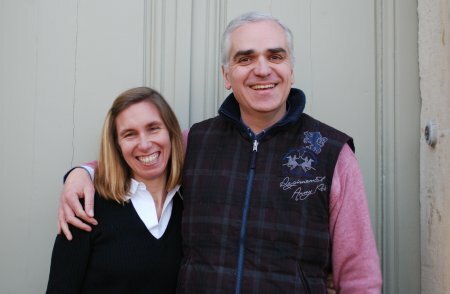 Fabiola and Didier, its new owners, preferred to open five guest rooms only. 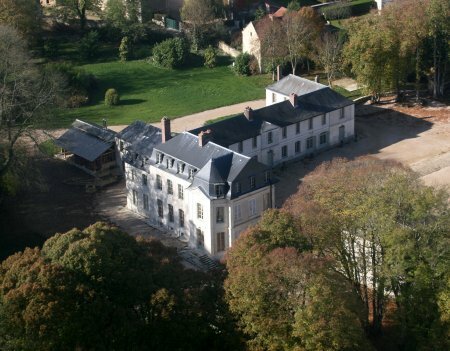 A whole wing of the castle dating back to the 17th Century is dedicated to the guests. 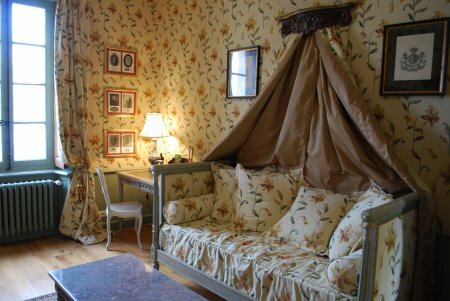 It has been completely renewed to offer very comfortable bedrooms and large sitting room, dining room and library, harmoniously decorated from furniture to flowery wall covering in Grand Siecle style. Unfold the inner shutters and dream sweet in the stillness of country side... Tomorrow morning you will enjoy a somptuous breakfast! Next, you could take advantage of the training room, or relax in the jacuzzi or sauna. 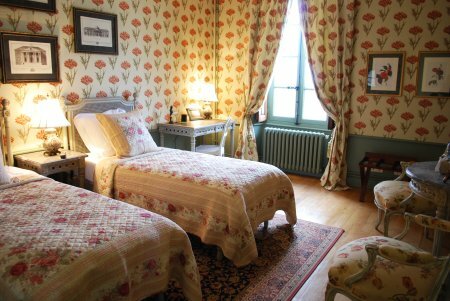 All these facilities are located in the former cellars of the chateau, which provide them a dramatic setting! If you prefer a walk, the little village of Maudetour is very quaint, and the neighbouring woods and fields don't lack charm. The Seine valley, cradle of Impressionism, is only minutes of drive away. Rates for guest rooms and suite according to duration of stay are listed in the table below. 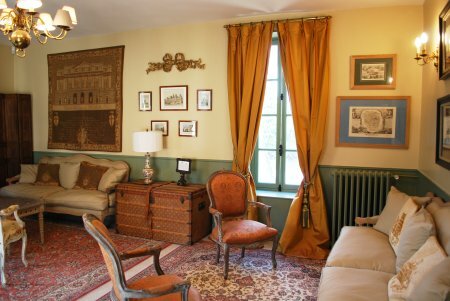 Renting the whole wing of the chateau is possible and enables private use of normally shared areas like dining room, sitting room, kitchen… Accomodation for 10 people at the most. 50% guarantee by cheque or transfer - no refund in case of cancellation less than 3 days prior to arrival. Check-in from 2.00pm onwards, departure before noon. 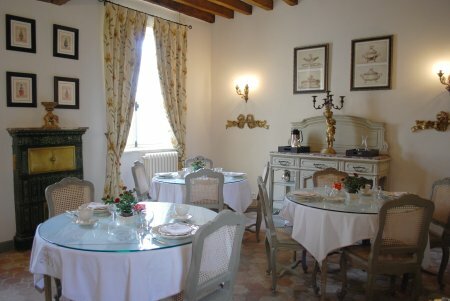 Breakfast is served from 8.00am to 10.00am in the guests dining room. The whole chateau is a no smoking area.